Microsoft is getting serious about convincing you to use OneNote as your primary note-taking app-slash-random data warehouse. In March, Microsoft announced OneNote would be free across all platforms to better compete with the likes of Evernote and Google's burgeoning Keep service. Following up its March freebie, Microsoft has released two new tools making it easier for Springpad users to find a new home and for Chrome users to clip the web with a handy OneNote extension. Forget about the bookmarklet, Chrome users now have a Web Clipper extension for OneNote. 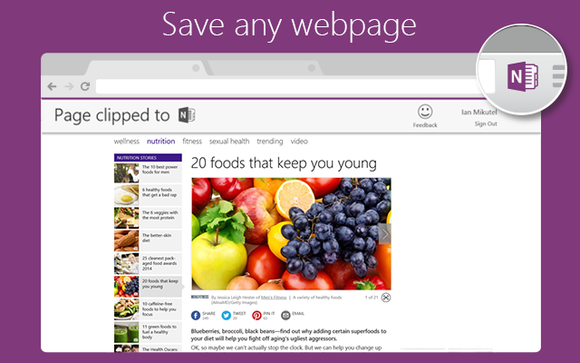 In March, Microsoft released the OneNote Clipper bookmarklet that let you save webpages to the QuickNotes section of OneNote. To install it, you dragged the bookmarklet into your bookmarks bar, signed in with your Microsoft account, and then clicked to save a web page. After several months of the web clipper being out in the wild, Microsoft discovered that a large number of OneNote clippers were using the bookmarklet in Chrome. To accommodate all those Google fans, Microsoft is now offering Chrome users a proper extension installed through the Web Store. To grab the extension, visit Microsoft's OneNote Clipper site in Chrome and then click the big purple button that says Install to Chrome. Next, click the Add button in the small pop-up window and you're done. Alternatively, you can grab the extension directly from the Chrome Web Store. If you want to add a webpage or photo to your notebook, just tap the extension icon and the page will be saved; however, the first time you use the extension you will have to sign-in to your Microsoft account. Microsoft is welcoming Springpad users with open arms. Note-taking competitor Springpad recently announced it would be shutting down on June 25. To help Springpad users migrate to another service, users can either download their data as a ZIP file or use a Springpad-to-Evernote migration tool. Hoping to lure more people away from Evernote and into OneNote's waiting arms, Microsoft has created its own Springpad migration tool. To get started, visit Springpad's Save My Stuff website and sign-in with your Springpad account. On the next page, click Export Your Data, enter your email, and then click the yellow Export Your Data button. Springpad says it will then notify you within 24 hours when your data is ready for download. In my case it took less than half an hour for my download to be ready, but your results may vary if you were a particularly heavy Springpad user. Once your download is available, click the "Download Zip" button in the email (being careful to avoid any potential phishing attempts) and your Springpad data will download to your PC. Next, visit Microsoft's OneNote to Springpad migration site, sign-in with your Microsoft account, upload your ZIP file, and OneNote takes care of the rest. In my tests, I was able to view my new Notebook immediately using OneNote online, but it took some time before the Springpad data showed up on the OneNote desktop app. 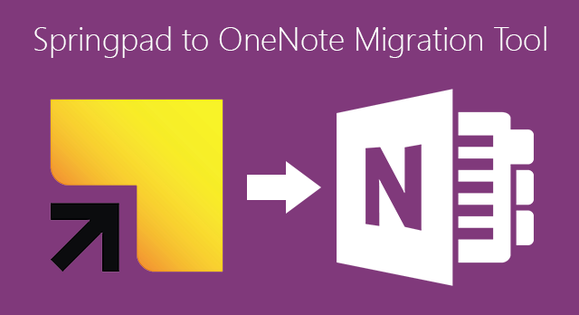 If you're not a OneNote user yet, the migration tool will automatically create your first OneNote notebook for you.